telegraphharp.com/patrick-higgins-bachanalia People have been reinventing Bach for nearly 300 years but there has never been anything quite likePatrick Higgins’ Bachanalia. Equal parts gorgeous and severe, these highly original arrangements of JS Bach prove the endless possibilities contained within the master’s pen. Bachanalia emerges from a dynamic relationship among three main elements: Higgins’ own virtuosic classical guitar playing, stereo electronic processing, and the recording spaces themselves. Truly site-specific, it makes unique use of the extreme and special acoustics of St. Cecilia’s Church in Brooklyn and Future-Past Studios, an upstate New York recording complex housed in a historic Lutheran church. While Bach’s compositions will be familiar to almost everyone, Higgins gives us a mesmerizing glimpse into the future. Described by The New Yorker as one of the “prime movers of the local avant-garde,” and an “exacting avant-classical guitarist” by Time Out NY, Patrick Higgins is a New York-based composer/performer of experimental music. Higgins has composed works for some of the nation’s leading ensembles, from chamber orchestra works, percussion cycles, and string quartets to smaller ensembles and soloists. He has scored music for television, museum exhibitions, and films both short-form and feature-length. Higgins plays guitar and composes in Zs, hailed by The New York Times as “one of the strongest avant-garde bands in New York.” As a producer and studio owner at Future-Past, Higgins has helped produce records for The National, Josephine Foster, John Zorn and Dither Quartet, Mantra Percussion, Zs, Eric Wubbels and Josh Modney, Ensemble Contemporaneous, Vicky Chow, and many more. For Bachanalia, Higgins and co-engineer Ben Greenberg worked with a collection of rare vintage Neumann, RCA, and Sennheiser microphones to carefully capture a spatialized natural room reverb. This provided a palate to warp, manipulate, and re-process the sound in precise counterpoint to Bach’s compositions. The end result weaves together live performance and studio composition. The musical arc reaches from light to dark, both in the emotional timbre of the compositions and in the density of the electronic elements. In the final three tracks (“Minuet,” “Chaconne,” “Aria da Capo”), both the experimentation and emotional intensity are pushed to new heights. This is highlighted in the “Chaconne,” Bach’s infamous death mass written after the passing of his first wife, presented here as a 14 minute epic recorded in two continuous takes. 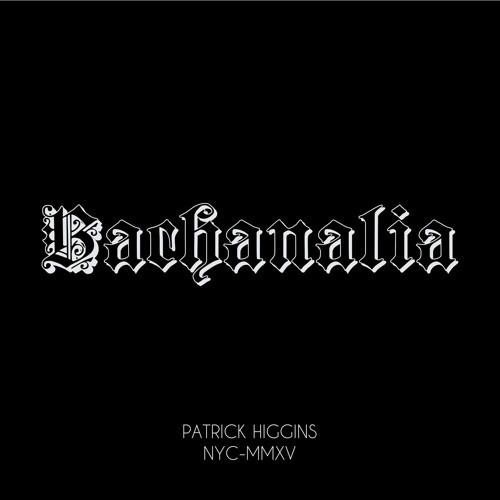 While any piece on Bachanalia can stand alone, the album articulates Patrick Higgins’ singular narrative vision from start to finish.